The mass of the top quark is a very important parameter of the standard model: using its value together with other no less fundamental ones (the W boson mass, the Higgs mass, and many parameters describing the properties of Z bosons) it is possible to study in great detail the predictions of the theory. In particular, due to the way heavy particles influence the Higgs field, one may verify the consistence of the standard model by looking at a graph where the top quark mass is in the x axis and the W boson on the y axis: different hypotheses for the Higgs boson mass then lie on different parallel curves. One example of such a graph is shown below. It is too complex to discuss it in detail here, but if you are curious I can supply more information in the comments thread. Until 2009, the business of determining with precision the mass of the heaviest quark, the top, was one of the Tevatron experiments alone. CDF and DZERO of course were the only experiments studying that particle, as they had been done since the top discovery in 1995. Their efforts to produce improved measurements of the top mass have led them to shrink the total uncertainty on the mass below 1 GeV, a result which far exceeded expectations. Of course, all good things come to an end - with the advent of the Large Hadron Collider and the demise of the Tevatron, the measurement of the top mass was bound to become a business for the ATLAS and CMS experiments sooner of later. The single most precise determination of the top quark mass had already become one produced by CMS over one year ago, but the Tevatron experiments by joining forces could still claim they had a better result. Now, however, CMS has published a result which is more precise that the former world average of other determinations. The new measurement is based on the single-lepton final state of top quark pairs, produced in the 8-TeV proton-proton collisions delivered in 2012 by the LHC. The single lepton final state arises when one of the top quarks decays to a lepton-neutrino-b-quark triplet, while the other quark decays to three hadronic jets. 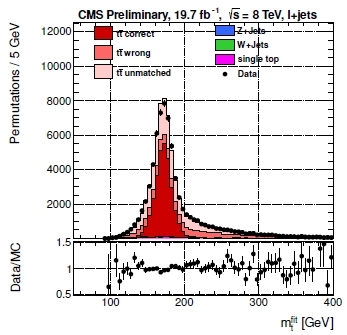 By selecting energetic electrons or muons, accompanied by four or more hadronic jets and showing some imbalance in the transverse energy distribution, it was possible to select very pure samples of top pair decays in the CMS data. And the purity can be improved further by requiring that one of the jets contains a b-tag - a signal of being originated by the hadronization of a b-quark. In fact, 999 times out of a thousand, b-quarks are always emitted when the top decays. Purity is a good thing when one is measuring something, but it is not everything. What matters most, when one has to determine the mass of the top quark, is to carefully calibrate the energy measurement of hadronic jets. The top decay allows for a nice "self-calibration" signal that can be used for that purpose: it is the W boson decay to a jet pair. One such decay is present in each of the selected events. Since the W boson mass is now known with a 16 MeV accuracy, it is possible to determine whether the jet energy measurement is miscalibrated by checking the mass value one can reconstruct with the two jets emitted in W decay. In truth the real procedure is more complicated than what I have described above: a two-dimensional likelihood is used to find the most likely value of the residual jet energy scale, looking at the W decay, and the top quark mass together. 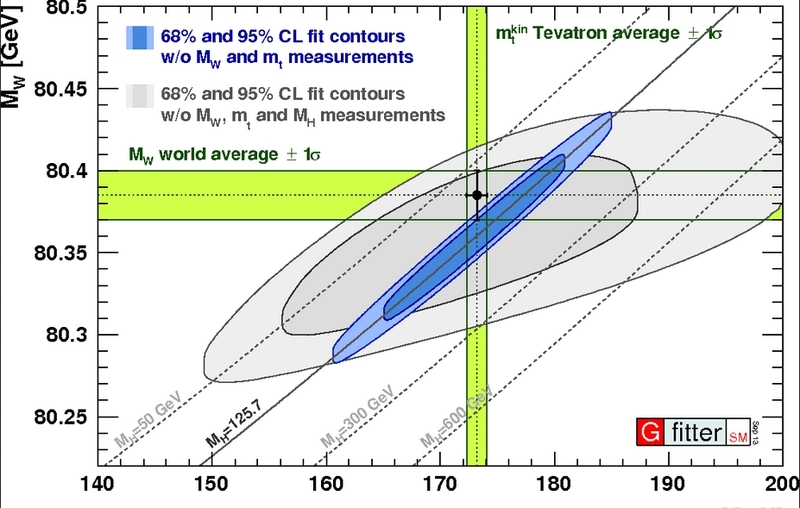 The procedure allows a measurement which has a total uncertainty of 770 MeV: the top quark mass is measured to be 172.04 +-0.77 GeV, a world's best result. On the right is shown the reconstructed mass distribution of the final set of event candidates by CMS, from which the mass measurement is ultimately extracted. The combinations are weighted by their probability, using a technique commonly referred to as the "ideogram method". The black points show experimental data, and the various histograms show the way data is interpreted as the sum of various contributions: top pairs, either reconstructed correctly (dark red) or with a incorrect permutation of jets (dark pink) or when a jet does not match to a decay quark (pink). Backgrounds are very small, and almost invisible on a linear scale. The bottom inset shows the ratio between observed data and sum of simulated distributions, showing that the interpretation of the data is very good. Using the above result and previous determinations, CMS has also produced an average of its own results. This comes out at 172.20 +- 0.73 GeV , a result which will be hard to beat for a while. The result is discussed in detail in the public CMS document available here. While CDF and DZERO cannot improve anymore their determinations, as they have already studied their full datasets, it will be nice to see how ATLAS responds to this new success of their competitors. But there is in the meantime another race still going on: the one of improving the mass measurement of the W boson. While as I explained above the W mass is known very precisely already, an improvement of our knowledge of that parameter would still be very interesting for more precise tests of the standard model.